Although the brewer in me knows that ‘lager’ is, ultimately, nothing more than a technical term I’m also aware that, in mainstream UK terms, ‘lager’ is a fairly specific thing – it’s light and crisp and generally fairly subtly-hopped. It’s somewhere that’s usually safe to go when a non-beery friend says “oh just get me a beer, not one of your weird ones”. So a dry hopped lager sounds almost oxymoronic – but deliciously so, given that while I drink more than my fair share of lager, they generally sit very much on the ‘drinking’ end of the spectrum rather than the ‘reviewing and enthusing about’ end. Galleon is a 4.8% dry-hopped lager brewed with Fourpure who, after a slightly shaky start, have become one of those breweries whose cans and bottles never fail to please. And they know a thing or two about packing hops into a beer. It certainly looks the part; a pale golden beer that almost glows, with a thin, light head on it. The aroma is marvellously hoppy; fresh, floral and peachy with just a touch of light honey lurking beneath. In the mouth, it does exactly what it says on the bottle – fundamentally a crisp and dry, light lager that is jam-packed with light fruity hop flavours that leads in a nice, clean finish. 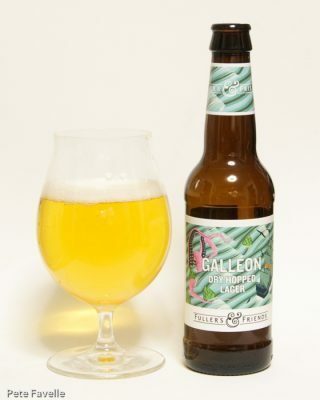 It all tastes like someone took a perfectly crafted lager, and then dumped a sackful of peachy hops into it on the way to the bottling plant – which is, fundamentally, what happened. I’m genuinely surprised and impressed by how well it works out, and I love it. 4.5 stars.